"Nintendo should make a Pokémon MMO" is usually the suggestion people like to default to when coming up with ideas for what Nintendo should do with the Pokémon franchise. 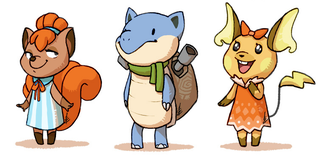 But, to me at least, that's not nearly as awesome of an an idea as a potential Pokémon x Animal Crossing game is. I'd play the heck out of that. And think about it: there are hundreds of Pokémon; there are no shortage of villagers one could make from Pokémon designs. You can see more of Turtle-Art's work here.